There are certain things that kick a bedroom up a notch when it comes to luxury: fancy lotion on the nightstand, a gorgeous chandelier, and especially an upholstered headboard. There's something about it that can instantly transport you to an upscale hotel room. Not to mention, they serve as a super-soft place to rest your head when you're reading or bingeing your fave Hulu shows. When I first moved into my house, one of the first items I searched for was an upholstered headboard, because I'm one of those people who loves to sit up in bed and I also wanted that luxurious feel. I finally found one at Target (yay! ), and it's lasted almost a decade. But I will say that it does take some upkeep to achieve that pristinely perfect appearance. Here are six things I wish I knew before getting my upholstered headboard. 1. It can stain really easily. OK, so I have this habit. I get out of the shower with wet hair, toss it up in a towel, and then I climb into bed to do some reading on my iPad while leaning against my white tufted headboard. And guess what? I realized after a few weeks that this little habit of mine leaves water stains. Depending on the color, spots can show up fairly easily on a fabric headboard. But the good news is that there are plenty of ways to clean them up, such as blotting with a wet cloth and mild soap. Or, use a gentle fabric cleaning spray. My husband and I have discovered that a steam cleaner works wonders on an upholstered headboard, too. Whenever it's needed, we steam away those water stains, and the headboard is as good as new. To keep this plush piece of furniture looking good, cleaning gurus generally recommend freshening it up once a week. 2. It’s a magnet for pet hair. We have a corgi (adorable, I know, but they are shedding machines!) and a very furry cat, so needless to say, pet hair is a daily struggle in our house. Since they both sleep in the bed, their hair always finds its way to my beloved headboard, creating a persistent layer of fur that rests on top of it. Here's an easy trick I've learned for banishing pet hair: a lint roller! Simply roll it over the front, top, and sides of your fabric headboard, and those tiny hairs will disappear. In addition to collecting all of my pets' hair, my upholstered headboard can get surprisingly dusty, too. I've learned that much like the nightstand and dresser, headboards also require dusting, but you won't be getting out your Swiffer for this one. Vacuum it around once a week (it's best to dust it off before you treat it for stains anyway) and use the extension wand to get to those hard-to-reach spots. 4. You’ll need to learn how to clean the specific fabric. Much like reading the tag to find out how to clean your favorite shirt, it takes a bit of research to learn how to clean the specific fabric that covers your headboard. Luckily, my headboard is microsuede, which makes it pretty painless to clean. But other fabrics deserve extra care, like silk, leather, or velvet. If your upholstered headboard came with cleaning instructions, that's a win. Otherwise, a few minutes of researching could help you avoid a bedroom disaster. 5. It tends to soak things up. As I mentioned before, my upholstered headboard loves to soak up those water stains. 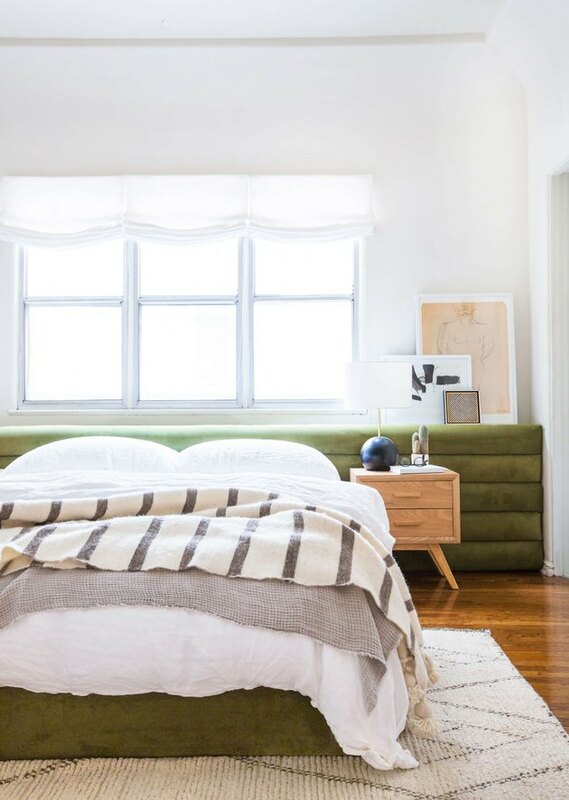 Since fabric headboards tend to be filled with foam and batting, they can act as pseudo-sponges, which means liquids, stains, and odors are absorbed effortlessly. For those soaked-up, set-in stains and odors, follow the same cleaning instructions as above and use a bit more elbow grease: first, use a vacuum, then a steamer, and do any additional cleaning that may be necessary and tailor it to your specific fabric. If the situation is dire (i.e. your dog decided to use your headboard as a fire hydrant), you can always take it to an upholstery pro. 6. It can take up a lot of space. Our bedroom is on the smaller side, but it was able to accommodate our sizable upholstered headboard. If you have a particularly diminutive room, consider the size and thickness of the upholstered headboard before purchasing. It might overwhelm the space, and instead, you can opt for a thinner headboard or no headboard at all. On the flip side, keep in mind that upholstered headboards can flatten or lose their shape over time. This is completely natural, considering they're made with foam. In this case, it'll need to be reupholstered, which you can try to do yourself, or you can take it to an upholstery shop. Yes, an upholstered headboard requires a little work, but I promise it'll pay off with the aesthetic value and hint of luxury that it can add to a bedroom. Ten years later, and I still love my tufted headboard and if you can keep it clean and fresh, you'll enjoy yours for years to come, too.